When state lawmakers passed a law in 2015 to allow public charter schools to operate in Alabama, they laid out two paths for potential charter school operators: (1) through the Alabama Public Charter School Commission and (2) through local boards of education who choose to become authorizers. Each group is independent of the other, and each has a different operational timeline. As such, it’s important to understand the differences between the two entities and the authority each has to bring public charter schools to your neighborhood. Charter school authorizers have an important job overseeing the operation of a public charter school and ensuring strong accountability, both academic and fiscal, for the charter operator. Authorizers have the authority to close charter schools, either by non-renewing or by revoking their charters, if the charter school operator fails to meet the terms of the contract. Though Commission President Dr. Ed Richardson has said that no public charter schools will operate in Alabama before the fall of the 2017-2018 school year, the application process is underway, and the two local boards acting as authorizers have until November 1 to publish a request for proposals (RFP) for applicants. Laying the right foundation through requiring authorizers to be accountable for the operation of charter schools is essential, according to the National Association Charter School Authorizers, which ranked Alabama’s charter school law fourth in the country out of the 44 states, including Washington, D.C., that have charter school laws. The National Alliance for Public Charter Schools ranked Alabama’s law second strongest in the nation, applauding lawmakers for incorporating the lessons learned from the first 25 years of the charter school movement. Minnesota was the first to pass charter school legislation in 1991 and opened their first charter school in 1992. The Alabama State Department of Education’s (ALSDE) Office of Public Charter Schools (OPCS) was created to develop rules and guidelines to implement the law. OPCS has its own section on the ALSDE’s web site and publishes a lot of information. There are two types of public charter schools authorized to operate in Alabama: start-up and conversion. The Commission can only authorize start-up charter schools, whether through initial application (where the local board has not registered to become an authorizer) or through appeal when the local authorizer has denied an application. A local board of education that registers as an authorizer can also authorize start-up charter schools. Conversion charter schools, when a non-charter schools is converted to a public charter, can only be authorized by a local board of education. If a local board denies a conversion application, it cannot be appealed to the Commission. No more than ten start-up charter schools can be authorized in any fiscal year. That cap disappears on April 1 after the conclusion of the fifth fiscal year after the effective date of the law, which our calculations project to be April 1, 2020. There is no cap on the number of conversion charter schools that can be created. The Alabama Public Charter School Commission (Commission) is composed of ten members appointed by the state board of education from a list of persons nominated by various people, including the governor, the Speaker of the House, the Senate Pro Tem, and the Lieutenant Governor. Due to half of the Commission’s members being appointed initially to a one-year term to allow staggering of appointments, the state board appointed five members to a two-year term at the May state board meeting. All of the incumbents seeking reappointment were reappointed. Lisa Williams replaced Sally Smith, Executive Director of the Alabama Association of School Boards, after she asked not to be reappointed. Here’s a list of Commission members, though it has not yet been updated with Williams’ name. An eleventh member will be added when the Commission is considering an appeal after a district authorizer has denied a start-up application. The Commission had its first meeting in August 2015. Committees are doing the work of the Commission, and two important documents have been created for use by the Commission, both of which apply only to start-up public charter schools, and apply only to those charter operators seeking to operate through the Commission’s authority. Those documents are the application for start-up charter schools and the contract for start-up charter schools. Again, these documents are for start-up charter schools seeking to operate in Alabama where the local board of education has not registered to be a charter authorizer in their own district. Only Athens City and Birmingham City schools have registered to be charter authorizers in their own districts. This means that a charter school operator seeking to open a public charter school in any of the other 134 Alabama school districts will apply directly to the Commission. In late May, the Commission announced it would accept Letters of Intent (LOIs) for any entity wanting to open a public charter school in the areas in which the Commission has jurisdiction. Though the LOIs are not binding, according to the Commission they initially set a deadline of June 7 to receive LOIs. No LOIs were received prior to that deadline. That deadline has been extended to August 1, which is also the deadline for applications from those hoping to open a public charter school by the fall of 2017. The Anniston Star reported that no applications have been received as of the first week of June. Local boards of education must register with the ALSDE as charter authorizers. That registration is fairly detailed, outlined here. Though as many as five boards of education initially registered as authorizers, ultimately only two, Athens City and Birmingham City, completed the registration process. OPCS officials said the registration process ensures the district has the capacity to serve as an authorizer. Registration documents are reviewed using an evaluation rubric to determine if the district is ready, and OPCS works with local boards to resolve concerns prior to approving the registration. Local boards who serve as authorizers, (local authorizers), can authorize either start-up or conversion charter schools. The deadlines for action by local authorizers are different than those of the Commission. Local authorizers are also given the authority to develop their own applications and contracts as long as all parts of the law are followed. Athens City Schools superintendent Dr. Trey Holladay said his district plans to adapt the application and contract developed by the Commission for use in Athens City. Local authorizers must issue a request for proposals (RFP) for charter school operators by November 1 of each year and give applicants at least 30 days to apply. The Commission does not issue RFPs. The OPCS developed guidelines for what must be in a local authorizer’s RFP, including the board’s strategic vision and the performance framework it uses for non-charter public schools. Local authorizers have 60 days to determine whether to approve or deny a charter operator’s application. The section of the ALSDE’s web site devoted to OPCS is layers deep. One very helpful document published there is a PowerPoint from March with an overview of public charter schools in Alabama. It also lays out the requirements for local authorizers, which could be helpful for those boards considering whether to register. Boards of education who have not registered as authorizers will have another opportunity to do so prior to March 1 of next year. Here is that document. How Will Alabama’s Education Landscape Change? Because no public charter schools are yet operating in Alabama, it’s unclear how the education landscape may change. Nationally, public charter schools are a hot topic of discussion. Questions abound. Are they good? Are they bad? Do they drain resources from struggling public schools? Do they offer opportunities to students who would otherwise be stuck in neighborhood schools that aren’t serving them well? And the answers to those questions? Well, it depends on who you ask and whose web site you are reading. The National Alliance for Public Charter Schools (NAPCS) has amassed a database of various dimensions of public charter schools, including enrollment by race, the percentage of students eligible for free or reduced-price meals, and what type of organization manages the charter school. Some elements are missing or have not yet been updated, but it remains the only place to find comparable data from state to state and even by charter authorizer in the country. When looking at performance data, it’s important to remember that the NAPCS snapshot of charter versus non-charter doesn’t consider growth nor reveal how similarly situated students in charters and non-charters are performing. 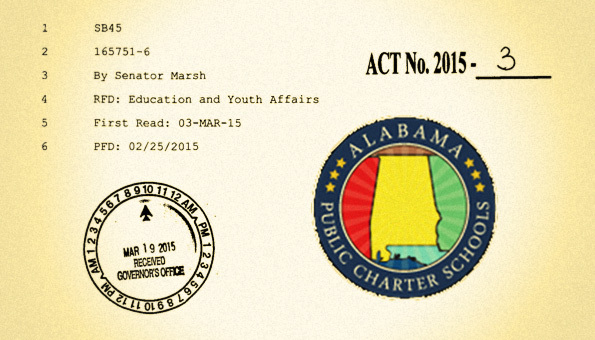 Here’s the Alabama School Choice and Student Opportunity Act. Posted in Charter School, School Choice and tagged "Standing Strong for Public Education", #iBelieve, Accountability, Accountability System, Advocacy, Department of Education, Diversity, Education, Education Funding, English Language Learners, Equity, Every Student Succeeds Act (ESSA), Failing, Failing Schools, Federal Education Policy, High-Needs Students, NEAExecutiveCommittee, Pension, Pensions, Public Education, School Choice, Students, Testing and Accountability. Bookmark the permalink.